This noble and distinguished surname is of pre-medieval origins. It derives from the Hebrew word "adama", meaning "earth", and as such is believed to the source from which God created man as recorded in the Old Testament section of the Bible. The surname can be English, Scottish, Irish, Polish, French, Catalan, Italian, German, Flemish, Dutch, Russian, Croatian, Hungarian, and was also given to 18th century Jews. It is recorded in over seventy spellings. These include such forms as Adami, Adamo, Adamsson, Adamsen, Dami, Adamski, Adamsky, Adnett, Adekins, Ade, Aitken, Aitkin, Atcock, Adamini, Adanet, Adamik, Adamcek, Adamcyzk, Adamec, Acheson, Adamovic, Hadkins, McAddie, Keddie, Kiddy, and many others. The baptismal name was always popular throughout Europe in the Middle Ages amongst the non- Jews, and is first recorded in England in the famous Domesday Book of 1086. Other very early recordings include Adam, the sub-prior of Melrose Abbey, Scotland, who became abbot of Cupar, Fifeshire, in 1189, whilst Alianor Adam, was recorded in the 1281 Assize Rolls of the English county of Cheshire. Surnames derived from given names are the oldest and most pervasive surname type, and in religious naming traditions, names were bestowed in honour of saints and biblical figures. Some bearers of the surname in Britain descend from French Huguenot refugees who fled religious persecution in their own country. 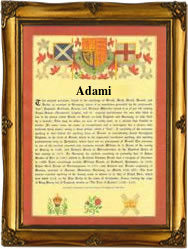 An example is Jean Adam, a witness at the French Huguenot Church, Threadneedle Street, London, on February 14th 1731. The first recording of the family name anywhere in the world is believed to be that to be that of German Adam, and dated 1273, in the "Hundred Rolls" of the county of Cambridgeshire, England, during the reign of King Edward 1st, 1273 - 1307.